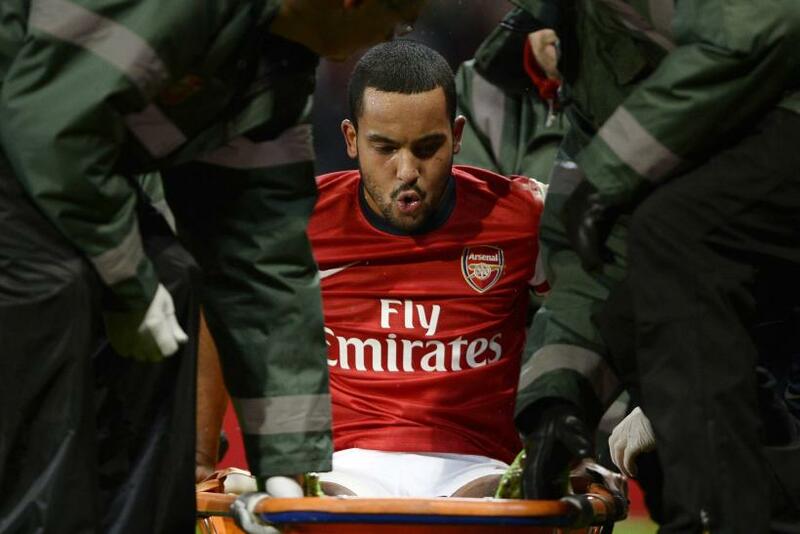 The news on Monday that Theo Walcott will miss the rest of the season after rupturing his anterior cruciate ligament could have a serious impact on Arsenal’s trophy hopes and, more immediately, on Arsene Wenger’s plans for the January transfer window. Wenger has suggested that he has enough options in his squad to provide cover for Olivier Giroud up front, but the long-term absence of Walcott, who played that role against Tottenham on Saturday, may well change his mind. Arsenal are already without Nicklas Bendtner for around a month, while youngster Yaya Sanogo remains on the sidelines having not played since August. Lukas Podolski, only just back from a long-term injury himself and more equipped to playing out wide, is currently the only alternative to Giroud, who has missed the past two matches through injury and has recently shown the effects of his heavy work load. One of the names that Arsenal have been strongly linked to is Atletico Madrid’s Diego Costa, with the Gunners thought to have watched the in-form forward on several occasions this season. Wenger laughed off the speculation late last week, suggesting that La Liga’s second-highest scorer this season would cost £145 million. However, it is well established that Costa has a release clause of €38 million (£31.6m), although Atletico sporting director Jose Luis Caminero claims that, even if that is met, the player, unsurprisingly given his club’s superb season, has no intention of going anywhere. "The player has a clause of 38 million euros and the big clubs in England know this," he is quoted as saying by Marca, according to Sky Sports. "Diego Costa has matured and is smart when it comes to decision making. "Right now, Costa does not think of leaving, he is hooked on Atletico. He has re-signed a deal that is important, I am confident he will continue with us." One man that definitely won’t now be joining the Gunners anytime soon is Robert Lewandowski, although Wenger claims it wasn’t for the lack of trying on his part. The Poland striker’s long expected free transfer from Borussia Dortmund to Bayern Munich, to go through at the expiration of his contract this summer, was finally confirmed over the weekend. Wenger confirmed that Arsenal were one of the clubs to have made an approach for the in-demand 25-year-old before discovering that they were fighting a losing battle. “Yes we looked into Lewandowski but honestly he signed for Bayern one and a half years ago, everyone knows that,” he explained, according to ESPN. "They can only make it official now because he is in the last six months of his contract. With Lewandowski’s move confirmed, rumors have begun about the future of Bayern’s current leading striker Mario Mandzukic. When asked about whether there was any truth to stories that Arsenal are interested in the Croatia international, Wenger suggested that he would consider an approach in the summer. “Lewandowski is at Dortmund until the end of the season and they will not sell Mandzukic now -- maybe at the end of the season,” he said. But Arsenal appear in need of someone for the immediate future and Wenger could turn to someone with experience of the Premier League. Sky Sports believes that Arsenal, along with Liverpool, are considering making a move for former Chelsea forward Salomon Kalou in this month’s transfer window. The Ivorian left Stamford Bridge, where he was a squad player for much of his six years, to join Lille on a free transfer in the summer of 2012. And having scored 14 goals in 28 Ligue 1 appearances last season and with six in 19 this campaign, the 28-year-old is now believed to be in-demand once more in England. Although he primarily played form the right for Chelsea, he has been largely deployed through the middle for his current club.